Starting solids is an exciting milestone for you and your baby. You need some essential tools for preparing your baby food, plates, bowls, cutlery also some more tools to feed your baby comfortably safe. However, it can also be challenging to know what to choose, especially when you’re overloaded with more baby feeding products available in the market. Worry not, Here is the list of feeding products (with product links to buy to online) to start your baby on solids! You can cook your baby food in different ways. Below are the best methods and products which ensure a minimal nutrient loss. It is the best method for cooking most of the baby food because it ensures nutrition preservation. You could invest in buying a steamer basket or baby food steamer depends on your preference and budget. There are a lot of baby food steamers and conventional steamers available in the market. I used Philips Avent steamer and blender for my baby, and I found it useful. It steams fruits, vegetables, fish, and meat. 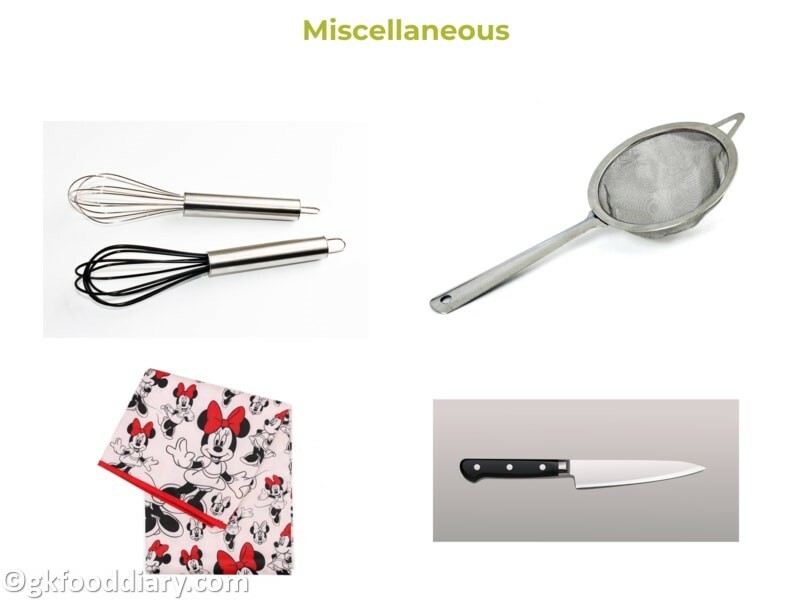 It also blends the steamed food to your desired consistency. You can also use Philips Avent steamer and blender to make juices and milkshakes. Steaming with Philips Avent combined steamer helps to retain essential nutrients a way better than usual conventional steamers because the juices that are released from the food during the steaming phase are preserved (which are evaporated in typical steamers) for mixing back into the food during the blending stage. 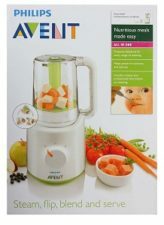 Here is my review of the appliance and how to use Philips Avent steamer and blender for baby food. 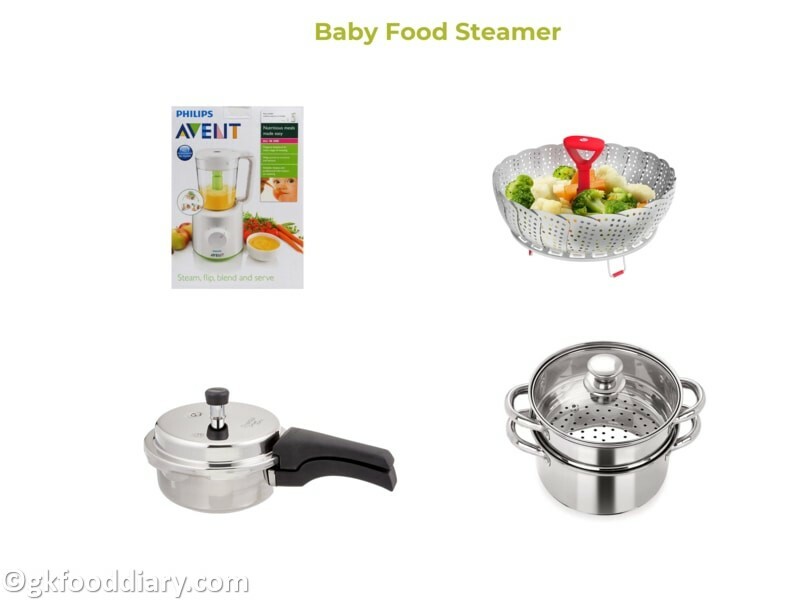 You can also use regular food steamer to cook baby food with steam heat. The steamer basket is another option to steam baby food. Place the steamer basket in a pan/saucepan and add only enough water to create steam. Cover and cook until tender. Pressure cooking is one of the readily available means of cooking baby food, and efficient as only less water is used. You can directly place the peeled, washed and cut vegetables in a bowl and put them in a pressure cooker with less water. Prefer buying small stainless steel pressure cooker for baby food. Blenders are quite essential for the first few months when you are starting solid foods. They do an excellent job of pureeing or mashing foods. You could be able to blend a small amount of baby food such as vegetable purees, fruit purees, shakes, homemade health mix powders, soups, mincing meat, etc. using the baby blenders/small food processors. 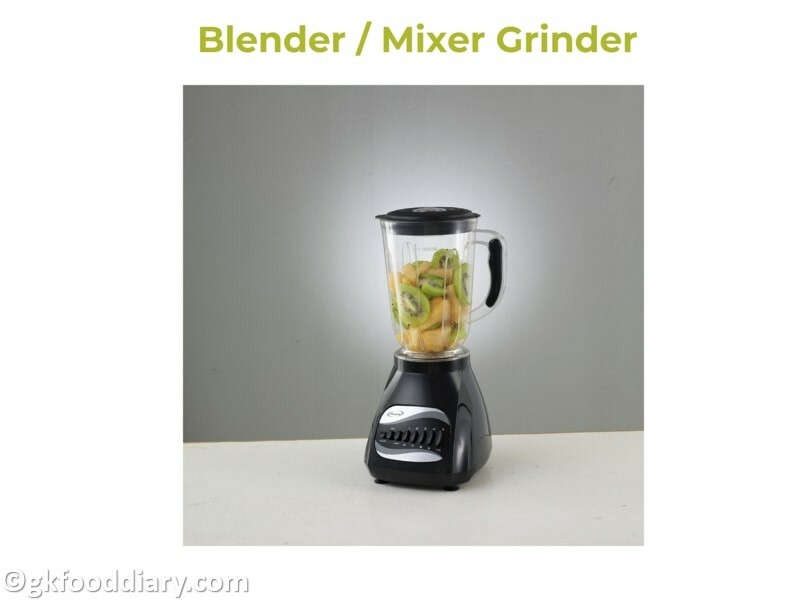 You could also use regular mixer grinders. However, make sure to use a small jar which comes with the mixer grinder exclusively for baby food. These are portable, easy to use and affordable option for preparing baby food. You can hold the hand blenders in your hand and blend merely over a bowl. Also, it occupies less space compared to huge blenders/food processors. The only downside of hand blenders is cleaning, which can be a little tricky process. 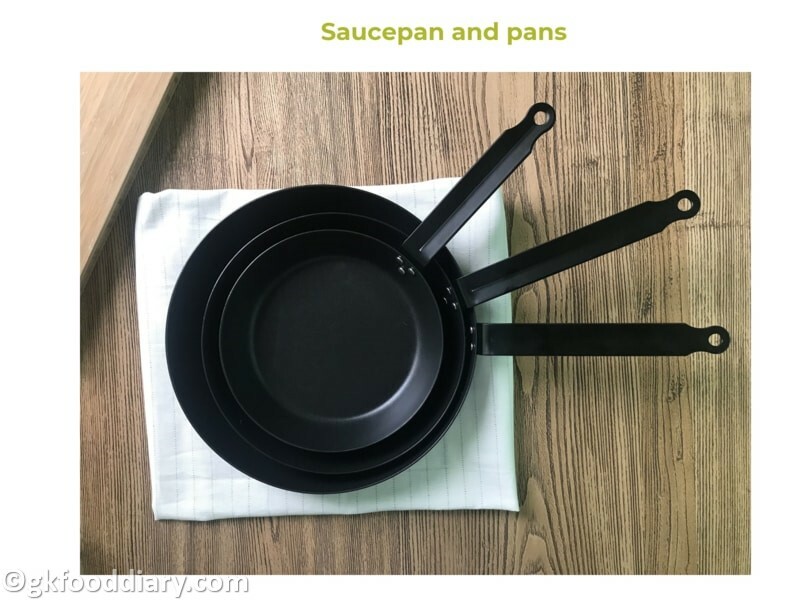 Saucepan, pan, and pots can be used for making all kinds of porridges, soups, dry roasting the cereals, nuts, dals, and grains to make powders. Especially saucepan is useful for making a small amount of baby food. Avoid nonstick pans and aluminum cookware for making baby food as they are not safe. Cleanliness and hygiene are essential when you make your own baby food at home as the baby’s immune system aren’t fully developed during the first year, and the little tummies are vulnerable to infections. Sterilizing will ensure that your baby remains protected from tummy upsets and diarrhea. We definitely can’t create a 100% sterilized germ-free environment; still, we can make sure basic hygiene by sterilizing the baby feeding utensils properly. Not all feeding equipment need to be sterilized, but be sure to sterilize the baby bowls, cups, spoons, and food containers. 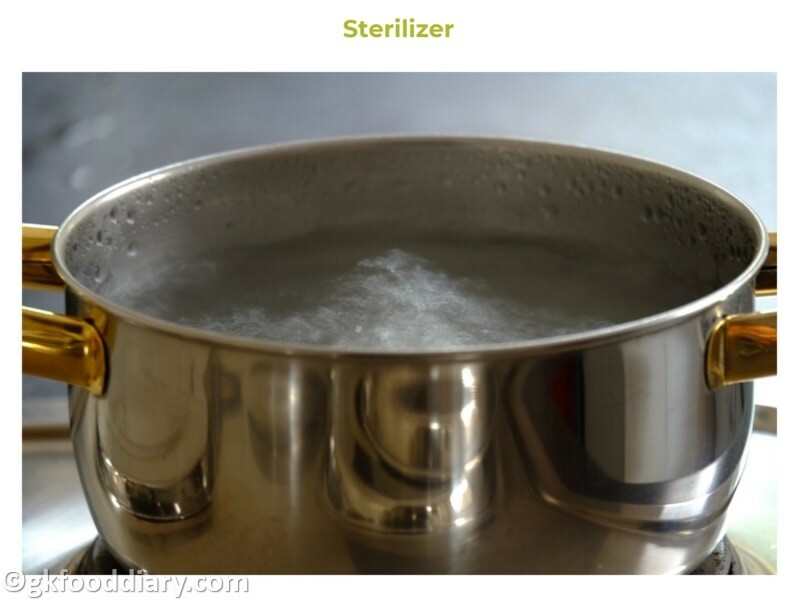 There are different types of sterilizing equipment are available – e.g., microwave sterilizing, steam sterilizing, etc. You can also use simple hot water pot sterilizing, fill a pot with lots of water, and immerse all the baby feeding equipment completely, then cover and boil for 10 minutes. Before you sterilize, clean the feeding equipment thoroughly. Feed your baby with small unbreakable bowls. There is a variety of bowls available in the market. 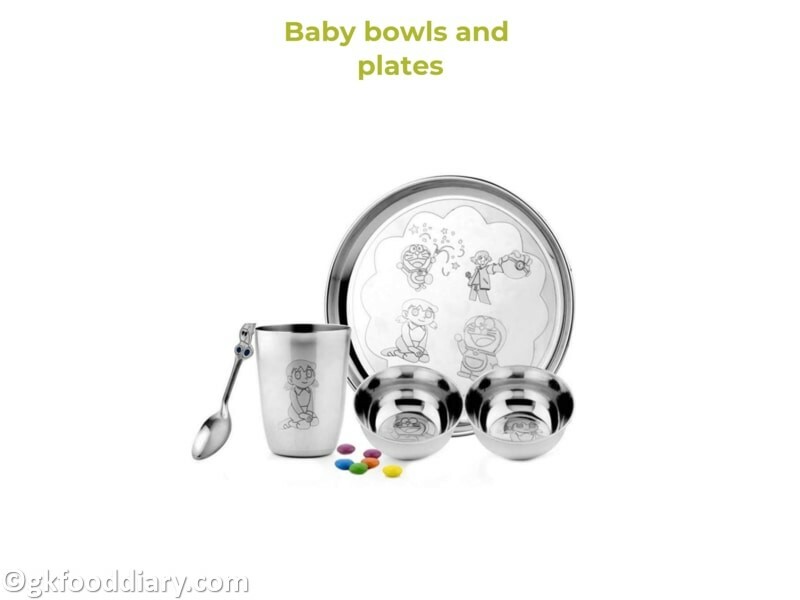 You could also use silver utensils for baby feeding if followed in your family’s tradition. Plastic Bowls: Buy small colorful plastic bowls which are baby friendly and BPA free when you start. Bright colors capture baby’s attention to eat the food. Make sure the bowls are freezer safe, microwave safe and dishwasher safe. Travel Bowls: Bowls with lid are useful during travel as it’s easy to take meals with you on the go. Suction Bowls: Suction bowls keep your baby’s food in place, it’s useful if your baby has the habit of throwing foods. You can stick the suction bowl in a table or high chair. Stainless Steel Bowls: If you are avoiding plastic, buy small stainless steel bowls. Plates may not be useful until your baby starts to self-feed. 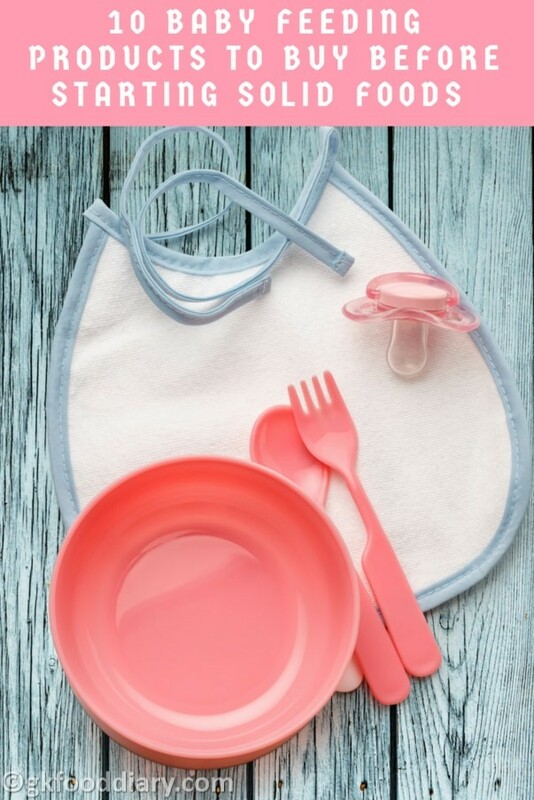 Once the baby started to eat by herself, serve meals for your little one with the handy Divided Plates with two or three sections which ensure the food not to get mixed. Baby Spoons: Begin with a small, bright colored, soft-tipped, shallow, short handled plastic spoons that are comfortable for you to hold and gentle on your baby’s gums instead of silver or stainless steel spoons as the baby’s gums are sensitive. Gradually you can shift to a slightly larger deeper and metal spoons. Short handled spoons may interest a baby when she starts feeding on her own. 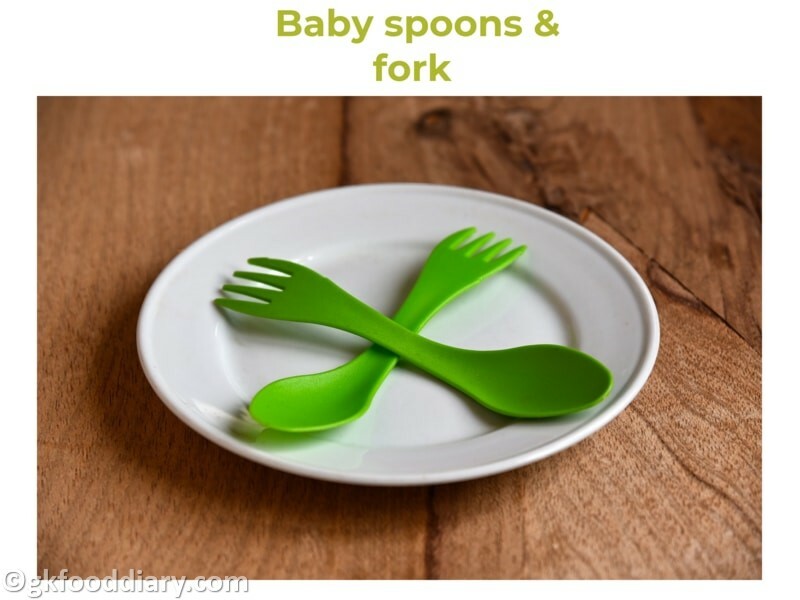 Baby Fork: Buy only baby friendly forks which have broader prongs with rounded edges which prevents injury of the baby. 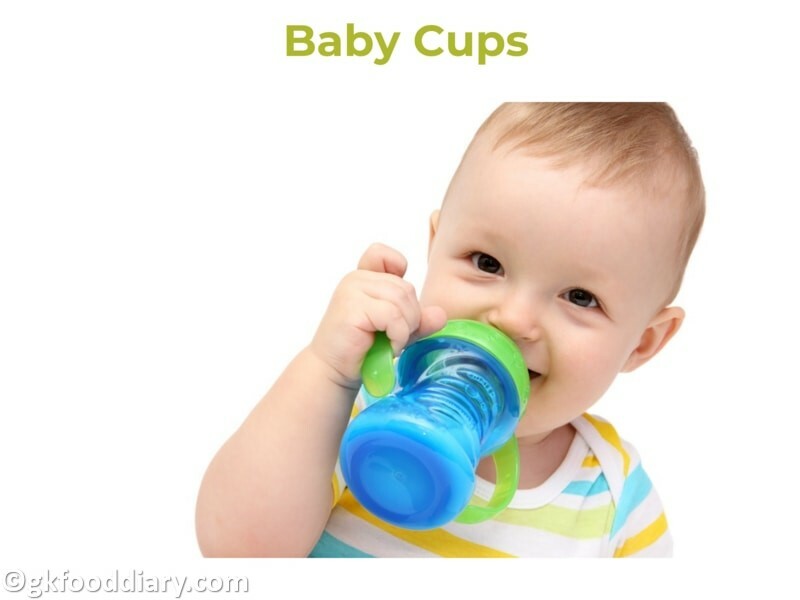 Sippy cups can be introduced to the baby at six months while giving water/juices. It helps make the transition from bottle to open cup more comfortable. Once your baby is doing good with a sippy cup, use an open cup by one year. Choose a spill proof sippy cup with a soft free flowing spout and grip handles, which assures to be gentle on gums while teaching baby to drink from a spout and makes it easy for baby to hold. 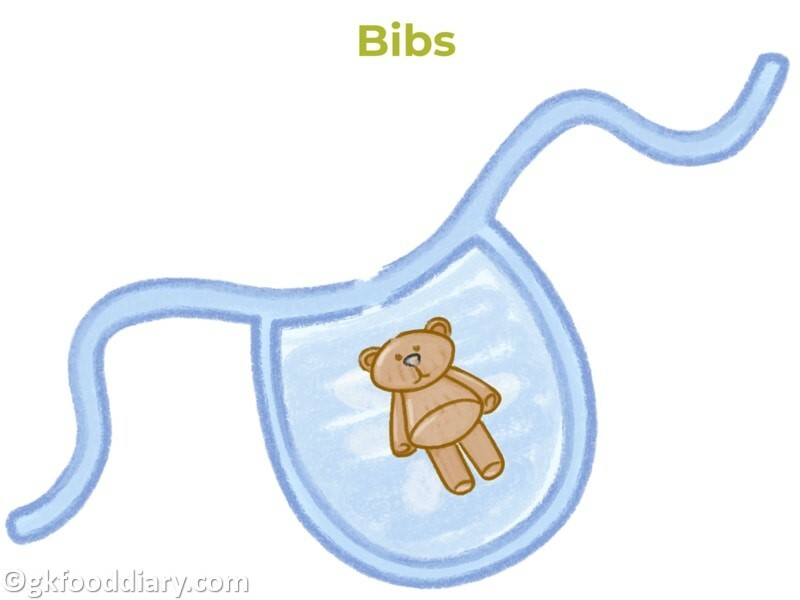 As the mess is unavoidable during baby feeding, Bibs is a necessary feeding supply for your baby. It protects your baby’s dress. There are many types of bibs available such as cloth bibs, plastic bibs, silicone bibs, full sleeve bibs, etc. Look for a bib which is large in size, waterproof and easy to clean. Start with cloth bibs, as your baby grows and becomes more independent, consider a plastic/silicone bib or a bib with sleeves. 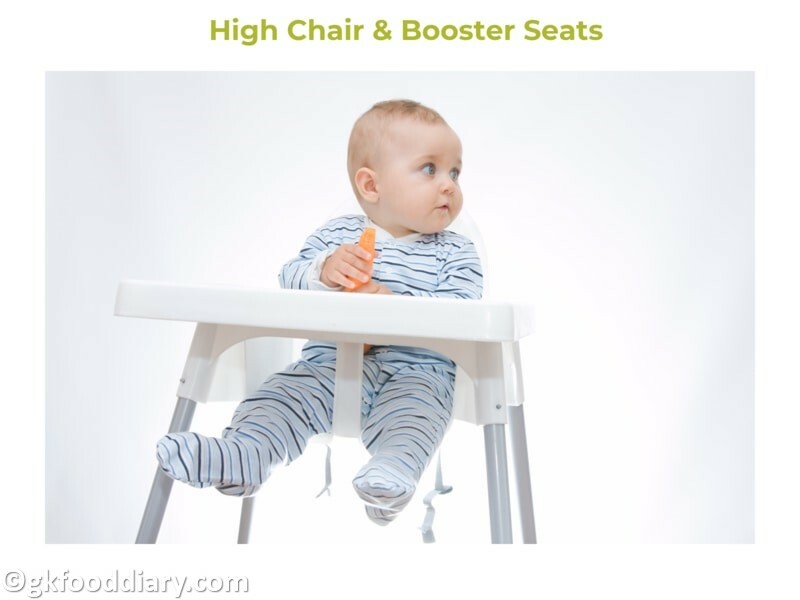 Hight chairs are another convenient and safe feeding essential for your baby as proper positioning is crucial while feeding the baby. High chairs ensure the baby is sitting upright and strapped. Start using high chairs only when your baby is sitting on her own without support. Always supervise your baby when sitting on the high chair as they may get poorly injured if falling out from it. There are many types of high chairs are available in the market. Choose a high chair that’s comfortable and easy to clean with wheels, footrests, wipeable cushion, detachable trays, and adjustable height settings. Basic model plastic high chairs are budget friendly. A booster seat is a seat that fits on your regular chair or dining room chair. It allows your baby to sit with the rest of the family during mealtime. You can buy a booster seat separately or opt for a booster seat high chair. Booster seat high chair can be transformed into a booster seat for your table when your baby passes the high chair days. The main drawback of the booster seat is the baby may feel less comfortable compared to the high chair. Other than the above-mentioned list, you may need few other items such as vegetable masher, splat mats, whisk, strainer, sieve, peeler, and knife for making baby food. Share your favorite products for starting solids with the baby! All information provided is intended for informational and educational purposes only. We do not accept any responsibility for any liability, loss or risk, personal or otherwise, incurred as a consequence, directly or indirectly, of any information or advice contained here. Some Photos included in this post are from Amazon. Opinions and suggestions about the products are 100% my own. Kindly do your own research before buying.